Looking for office furniture in Fort Wayne, Indianapolis, Warsaw, South Bend, or surrounding areas? At Workspace Solutions, we carry ergonomic, well designed office furniture that meets your unique expectations. We have all sizes and shapes of desks, workstations, stand-up desks, office chairs and filing and storage systems, and more from modern to traditional. You'll also find a wide variety of used used office furniture from many leading manufacturers . These options deliver outstanding performance at a fraction of the cost of new furniture. 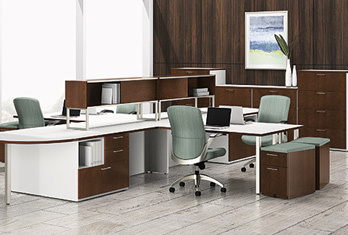 The backbone of any office, Workspace Solutions offers desks and workstations, including adjustable-height desks, from leading brands all designed to fit the needs that are unique to your office. You can also purchase used desks and workstations from the Workspace Solutions used office furniture showroom..
Everyone needs a place to sit. 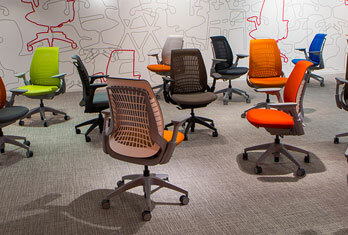 Workspace Solutions can help you find the perfect office chair in a wide variety styles, materials and fabrics. 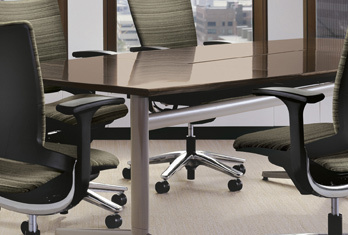 From executive chairs, desk chairs, computer chairs, and task chairs to waiting room seating, folding chairs, and conference chairs, we offer products from many leading office furniture manufacturers that are designed to be comfortable and increase productivity. A well designed filing system is a must in every workspace. They improve efficiency by making it easy to locate important documents. With our wide variety of options in many sizes you are sure to the right filing and storage solution. 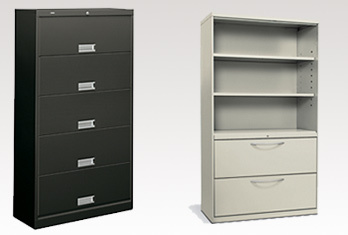 We also offer used filing systems, bookshelves, and storage solutions. Whether hosting a meeting or conducting a training session, you need tables in your office. Workspace Solutions offers everything from conference room furniture designed to impress new clients to work tables, lunch tables, and more. You'll also find used tables in our used furniture showroom..
Our Fort Wayne office furniture store on Production Road offers a wide variety of quality used office furniture. Desks, conference room furniture, workstations, office chairs, filing cabinets and more can be found at a fraction of the cost of buying new .